Yuck! What’s Going On Inside Your Carpet? Carpets can look quite clean with very little actual cleaning ever having to be done. Unfortunately, looking clean doesn’t always mean being clean. Carpets from afar may seem clean, but if you get a little closer and really take a look, you will likely be surprised at how dirty it actually is. Approximately 22% of American adults consider their carpet to be even dirtier than their toilet seat. Needless to say. carpets may be a lot more unsanitary than you might have originally thought. You can’t just take a vacuum to them and expect them to sparkle, after all. You have to work with professional home carpet cleaners who specialize in carpet cleaning services. Before you look at your carpet, however, you might want to find out exactly what’s going on inside the fabric. According to Life Hack, 90% of people admit to spilling food on their carpets and then eating off it. Yuck! The five-second rule has always been a myth, but you should never eat food from your carpet because it’s likely much dirtier than you think. Additionally, 75% of people walk on their carpets while wearing their shoes, subsequently tracking in even more dirt and grime into the home. Although your seemingly harmless habits can lead to unclean carpets, the natural buildup of bacteria can do so even more quickly. 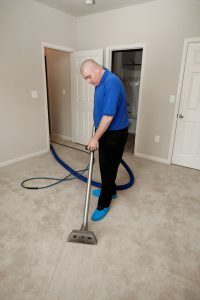 Dust mites, pollen grains, dead skin cells, volatile organic compounds, dirt, other bacteria, pet hair, and even pet urine can all pile up inside your carpets and lead to significantly dirty homes. Though vacuuming is important and should be done regularly, it’s never going to be enough to fully clean your carpets and rid them of these nasty particles. That’s where professional cleaning services come in. Experienced carpet cleaners can remove any deep dirt and bacteria particles living inside your carpet, completely remove any major stains, and even extend the life expectancy of your carpet altogether. Don’t ignore your home’s dirtiest area just because it looks fine from a few feet away. Take a deeper look at your carpet, realize how gross it actually is, and get professional help right away. Contact Clean Way Professional Cleaning Services today if you are in need of assistance.